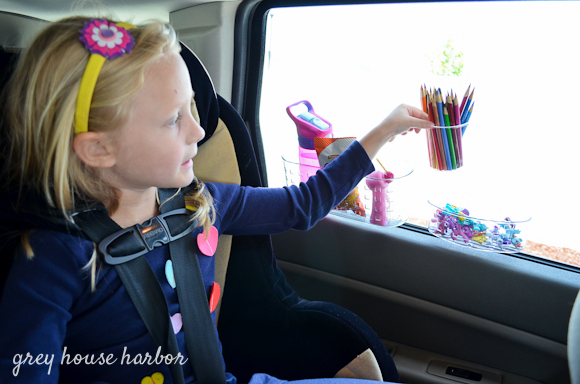 Earlier I shared a few cheats on how to get your car clean for a road trip with two kids. Today I’m back with my game plan for keeping my munchkins happy along the way. This topic really deserves 2 posts – organization and entertainment. 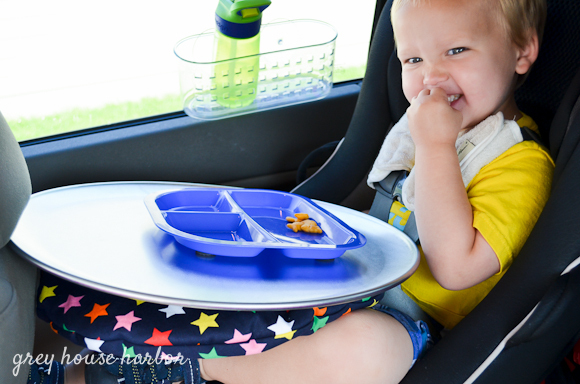 For such a long ride, each child needs their own area to eat and play. I had seen the idea of setting a cookie sheet atop a pillow and, while I liked the magnetic factor, I found the lip of a cookie sheet to be uncomfortable on arms for extended periods of time. So, I developed a similar lap tray using a pizza pan. Look for the step by step tutorial on how to make your own next week! By simply attaching self-adhesive magnetic buttons to the bottoms of things, you significantly cut down the spill factor. 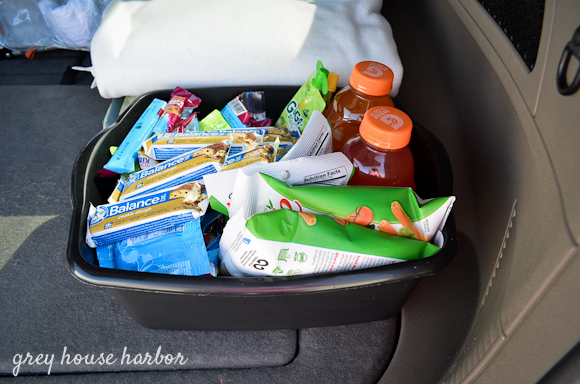 Duh… these are essential to road trip success – kids or adults! I tried to pick things that didn’t need refrigeration and already came individually packaged: granola bars, pretzels, lunch-sized goldfish, fruit squeeze pouches, and veggie straws. I also divided up larger bags of things like Chex Mix and Cheerios into sandwich-sized ziplock baggies. 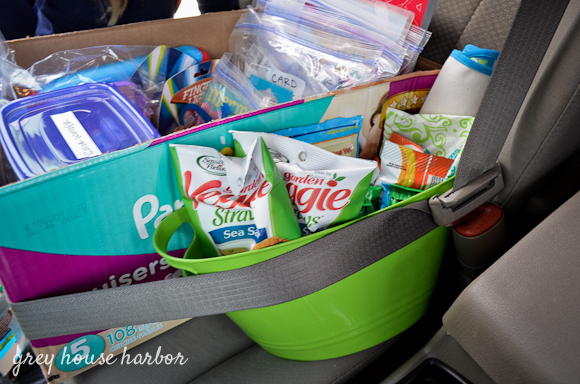 In the front seat I put a few snacks in a dollar store bin with a package of baby wipes for spill maintenance. Although I am an impeccable driver, I also buckled them in to prevent flying food in the event of quick stoppage. 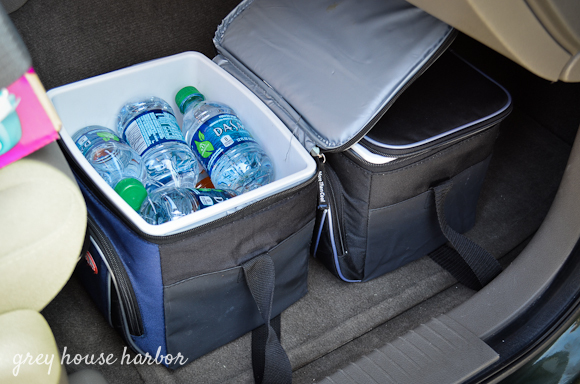 On the passenger floorboard I put Gatorade, water and energy drinks into insulated lunchboxes to grab in-between meals. Another bin in the trunk has back up snacks and drinks. All those snacks and meals on the go are bound to generate a few handfuls of trash. 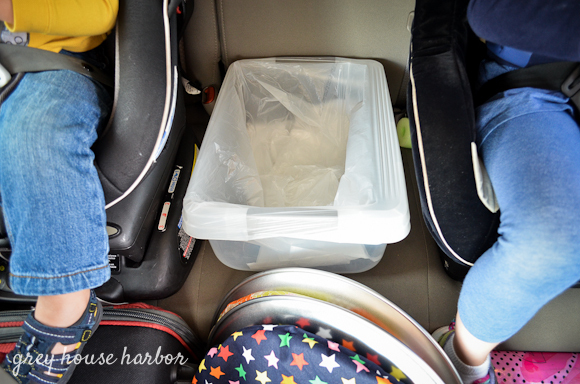 A tupperware bin with a trash liner shoved between the carseats works great. Kids can reach it themselves. Be sure to bring the favorite blankets and stuffed animals. Leaving a child’s legs dangling for hours on end can prove very uncomfortable. Place kids’ suitcases on the floor beneath their feet as footrests. This also frees up a ton of trunk space for other travel goodies. “Just In Case.” Once, when Bug was tiny, we had an incident that left me with a blowout and no diapers. 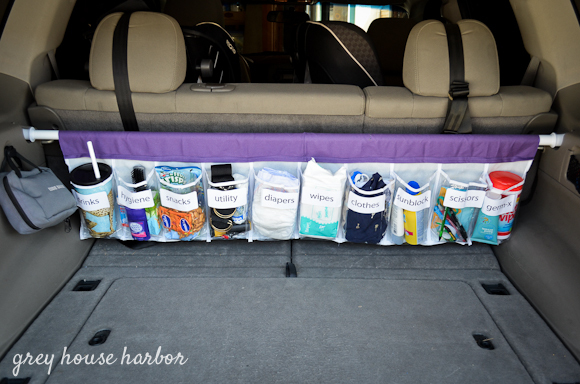 I swore that would never happen again and fashioned this car organizer to keep all sorts of extra necessities handy in my vehicle; things like bungee cords, diapers, wipes, extra clothes, sunblock, scissors, etc. Basically it’s just a plastic shoe organizer that’s been cut, restitched and hung from a cheap shower rod. Some day I’ll get around to posting a tutorial if ya’ll want. 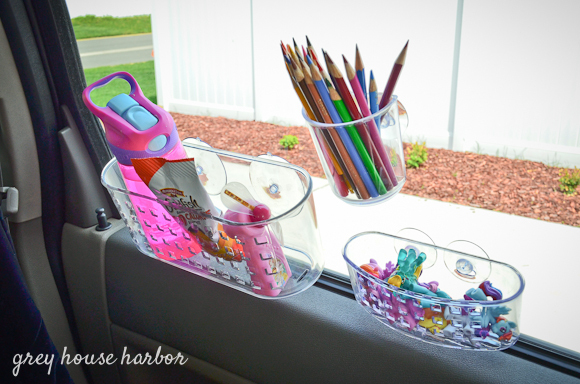 You have some phenomenal ideas here – like the suction baskets on the windows and the magnetic tray. You’re going to make my 10 car ride to the beach with a 13 month old MUCH easier!! Thanks so much! 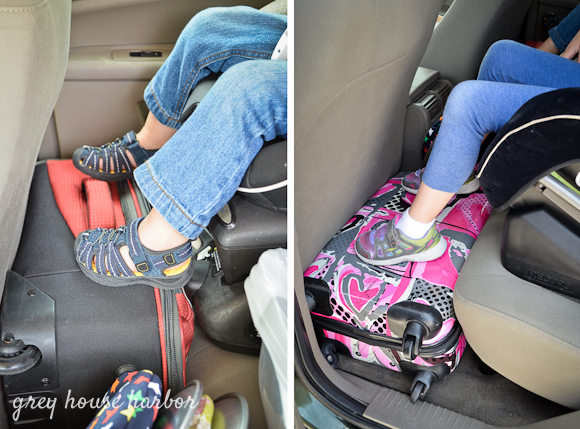 Please adjust the car seat straps in the last pic (trunk organizer). The back strap goes ‘under’ the headrest not over. Geralyn – thanks for your concern. This is a Jeep Grand Cherokee and the headrests do not remove. The owners manual for the vehicle states that the straps should be secured over the headrest as I’ve done. Good lookin out though! Love the ideas! 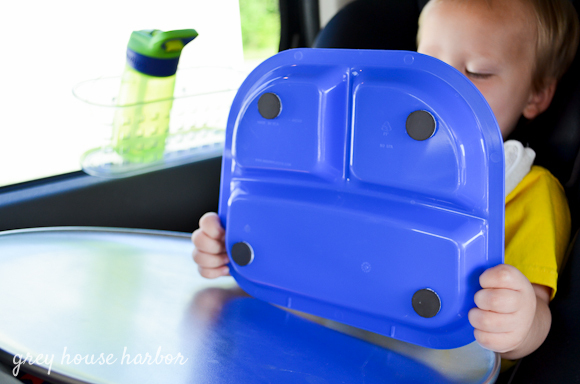 Hadn’t thought of magnetic adhesives for snack tray. Thanks! Very clever ideas. The suction cup one, although cool looking scAres me in case of an accident, we were in one last year and those cups would’ve smashed into a Kids face and those supplies would’ve went flying and could’ve injured someone (no matter what they were). Really changed my perspective on keeping the car organized and how important it is to not have things loose. I’m liking the other ideas though!! :) thanks so much!! !